Making use of stress management methods is essential to take charge of one’s own health and mind. Although it is not an easy job, managing stress is a prerequisite to living a healthy and happy life. However, the best quality sleep occurs in the early part of the night, which is in accordance with the sunnah of the Prophet(pbuh) who advised us to sleep right after ‘Isha salah. Sleeping around 9-10 pm also makes it easier to wake up for Fajr. However, if you happen to wake up in the middle of the night and cannot fall back asleep, get up and pray tahajjud. Also if you get chance, take a short power nap after Dhuhr. In reality, it is difficult to avoid all sources of stress as we encounter a myriad of situations on a daily basis, but do not let stress control your life. 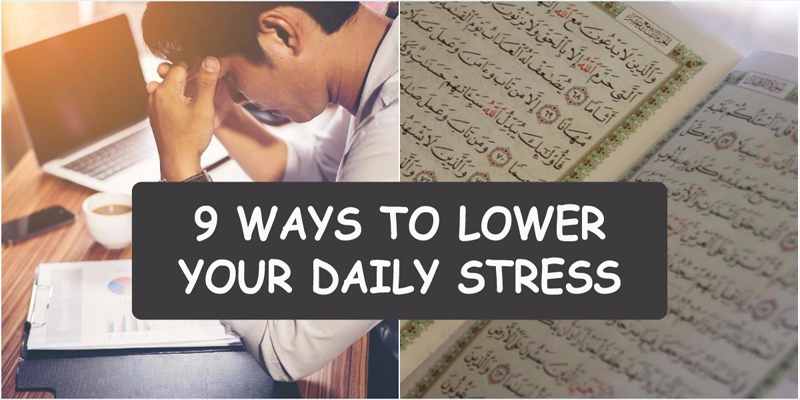 Try to make a little time everyday for your health and well-being, as they are blessings from Allah.